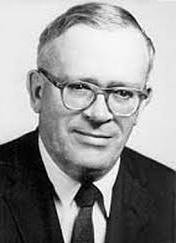 Young Americans for Freedom gave Weaver an award for "service to education and the philosophy of a free society"
Richard Malcolm Weaver, Jr (March 3, 1910 – April 1, 1963) was an American scholar who taught English at the University of Chicago. He is primarily known as an intellectual historian, political philosopher and a mid-20th century conservative and as an authority on modern rhetoric. Weaver was briefly a socialist during his youth, a lapsed leftist intellectual (conservative by the time he was in graduate school), a teacher of composition, a Platonist philosopher, cultural critic, and a theorist of human nature and society. Described by biographer Fred Young as a "radical and original thinker," Richard Weaver's books Ideas Have Consequences and The Ethics of Rhetoric remain influential among conservative theorists and scholars of the American South. Weaver was also associated with the "New Conservatives," a group of scholars who in the 1940s and 1950s promoted traditionalist conservatism. Richard M. Weaver is currently considered a "single author." If one or more works are by a distinct, homonymous authors, go ahead and split the author. Richard M. Weaver is composed of 4 names. You can examine and separate out names.